Cell682 can be placed at a remote, unmanned facility to detect a variety of potential equipment problems, and can even perform some output control. It uses standard cellular technology to communicate with the Sensaphone servers. If a telephone line is not already in place, the cellular communications in the Sensaphone Cell682 can provide a convenient, reliable, and cost effective method to monitor a remote facility. Watching over a remote site can be a challenge when the location is very remote. The New Sensaphone SAT4D is designed to monitor remote sites no matter where they are located. Instead of relying on phone lines or cell phone services which are not always available, the SAT4D uses direct satellite communications. The result is 100% communication coverage across the United States as well as many other countries, too. No need to worry about cell phone coverage maps, which carriers are in the area, or analog vs. digital support. It works everywhere, plain and simple. The ALL NEW Sensaphone Web600 provides flexible web-based remote monitoring at an affordable price. Keep track of critical temperatures and other conditions and be notified immediately when current values exceed the normal range. For small businesses, property owners, and more, the ALL NEW Sensaphone 400 offers an easy, inexpensive way to monitor a remote facility. It can be installed in any clean indoor environment to monitor a variety of applications. The 400 has a built-in ability to monitor for power failures and to listen to the sound of a smoke detector. There are also four external inputs that can be connected to a variety of sensors to monitor temperature, water on the floor, humidity, and much more. One of the four external inputs already comes with a temperature sensor for monitoring temperature where the 400 is installed. The Sensaphone 1800 provides a significant step up over the 1108. While performing all of the functions of the 1108, the 1800 comes in a sealed, weatherproof, lockable enclosure, making it suitable for harsh or corrosive environments. 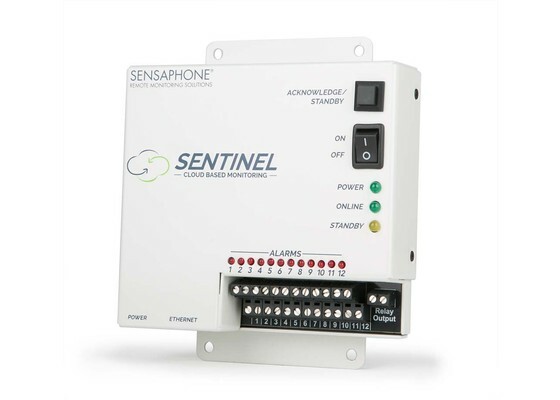 The robust Sensaphone Express II offers a comprehensive package of standard monitoring and control features. Easy to install and program, the Express II expands to meet the needs of your system today and tomorrow. Sensaphone's latest development, the IMS-1000, provides a flexible, web-based monitoring system for many applications. It connects to any Ethernet network and has a built in web server for viewing status, making programming changes, and reviewing data log history. Introducing the Sensaphone IMS-4000, a stand-alone infrastructure monitoring system with integrated voice and modem, internal UPS, flash-disk storage, and a web server, in a simple-to-install 1U-rackmountable package. From the wide array of its plugandplay monitoring devices to its sophisticated software, the IMS-4000 is the complete, flexible, integrated system. The IMS-4000 Dry Contact Node provides eight dry contact inputs (normally open/normally closed) and works in conjunction with the IMS Host. The Dry Contact Node is a cost-effective solution when your application only requires monitoring of dry contacts. With this device you do not need to use Dry Contact Bridges, thus reducing cost, installation time, and space.